Presentations can be incredibly dull, with slide after slide of too much text and mind-numbing bullet points. Short of eliminating PowerPoint altogether, how can people add spice to these things? This week, I tested Haiku Deck, a free app from Seattle-based Giant Thinkwell Inc. that has the potential to shake up the way presentations are made and shared. It works on Apple’s iPad, a device most people wouldn’t instinctively reach for when creating a presentation. Haiku Deck is named after the three-line, 17-syllable, Japanese poem, and like a haiku, it intends to create something beautiful and enjoyable while staying simple. The app can make all sorts of slide shows, from committee presentations to wedding photos. Though the app is limited to iPads now, by the end of this year, Giant Thinkwell will introduce a Haiku Deck app for tablets running Google’s Android operating system. And this isn’t the first app to introduce presentation-making on the iPad; Apple’s Keynote app, for example, does this, but costs $10 and is much more complex than Haiku Deck. Simplicity rules in this app. Each slide in a Haiku Deck can have no more than two lines of text, though these lines can be arranged in various layouts. Each slide contains a single full-bleed photo associated with its text. The app offers image suggestions that might best represent keywords in the slide. Images are pulled from over 35 million photos in the legally shareable content site, Creative Commons, using a Haiku Deck algorithm. If you prefer, photos can be pulled in from your iPad, or from networks like Facebook, Instagram, Flickr and Picasa. Themes are applied to slide shows in one step, simultaneously changing all slides’ font styles and sizes. Themes are limited to five free ones that come with the app and 11 Premium themes that are available for $1.99 apiece. In 20 minutes, I created a slide show about Haiku Deck using the free Cinematic theme. I had a blast using Haiku Deck and often did so while watching TV with my iPad on my lap. I made a few decks and I was surprised by how simple they were to put together. Friends who saw them thought I took much more time to make them, considering how professional they looked, and were surprised to hear I made them using just an iPad. I shared my work with others using a link people could click on to play the slide show with any Internet-connected device. I played them on Macs, Windows PCs, iPads, iPhones, Android phones and BlackBerrys. But even when I used Haiku Deck to make a deck of my trip to Charlottesville, the app’s smart suggestions of photos that might go with keywords in my slides were entertaining to look at and I used several photos from Creative Commons to supplement images I didn’t have. For example, one night we wandered the University of Virginia campus, but I didn’t take any photos that came out well in the dark. Haiku Deck suggested a huge list of images related to the keyword “UVA,” and I typed “night” into the search box to get more specific images. After a while, I did this often to find the right photo. 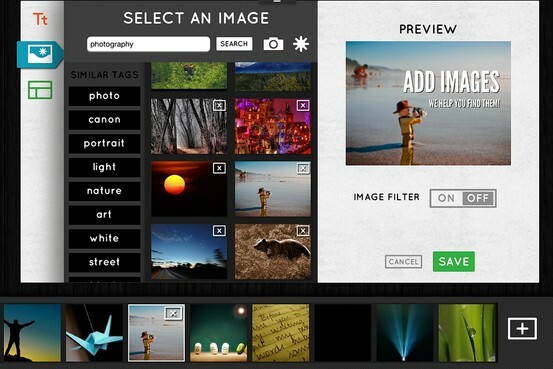 Photos are automatically suggested according to keywords in Haiku Deck slide shows. From the iPad app, I could email decks, share them on Facebook or Twitter or export them as PowerPoint presentations. After looking at a Haiku Deck on the Web, people can download it as a PDF; this feature will eventually also be available on the iPad app. And with a Haiku Deck account, I could make my slide show public, private or restricted, meaning only people who got the URL could see it. There are downsides to Haiku Deck and Giant Thinkwell is working on fixing some of them. These include adding the ability to play music with slides and extra layout and text options. It will soon add the ability to make two versions of the same slide shows using different themes. The company also plans to add presenter notes. I also noticed that in Edit mode, where the slides appear in a small tray at the bottom of the screen for easy rearrangement, I couldn’t see the text on slides, which got confusing as I rearranged similar images from my trip to Charlottesville. The company said this was a design choice to keep the interface uncluttered. If you want to make a presentation that’s enjoyable to look at and complemented with images you might not have, Haiku Deck is a smart app that makes beautiful slide shows in no time and makes your iPad a more productive tool.